The Chandra image of the Centaurus galaxy cluster shows a long plume-like feature resembling a twisted sheet. The plume is some 70,000 light years in length and has a temperature of about 10 million degrees Celsius. 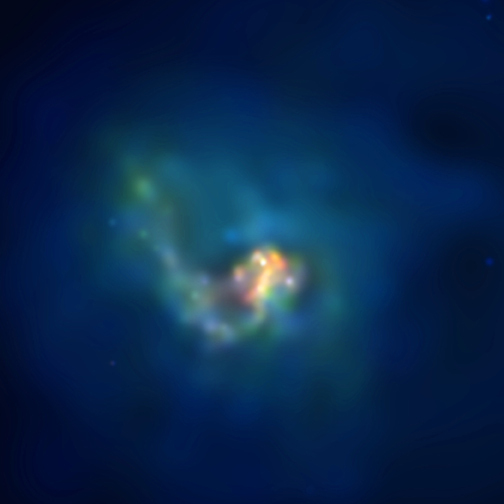 It is several million degrees cooler than the hot gas around it, as seen in this temperature-coded image in which the sequence red, yellow, green, blue indicates increasing gas temperatures. The cluster is about 170 million light years from Earth. The plume contains a mass comparable to 1 billion suns. 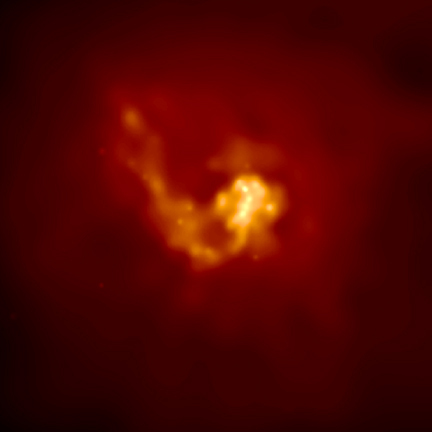 It may have formed by gas cooling from the cluster onto the moving target of the central galaxy, as seen by Chandra in the Abell 1795 cluster. Other possibilities are that the plume consists of debris stripped from a galaxy which fell into the cluster, or that it is gas pushed out of the center of the cluster by explosive activity in the central galaxy. A problem with these ideas is that the plume has the same concentration of heavy elements such as oxygen, silicon, and iron as the surrounding hot gas. Scale Image is 3 arcmin on a side. Coordinates (J2000) RA 12h 48m 48.7s | Dec -41° 18' 44"